Get set to travel back in time and discover the land of the unthinkable. Brush shoulders with the giant reptiles that we have only known in action figure form, these beasts of nature are the sole theme for this incredible new slot by non-other than the rapid risers in Pragmatic Play. A slot game based on the prehistoric times, it’s an action-packed adventure where players can learn the power of the dinosaurs themselves in what they possess in this 6-reel thriller. Spin the reels but don’t get too comfortable as I’m sure you don’t need to be reminded that you will be in the dinosaur’s den, play smart and you might just leave the Jurassic’s wild alive and wealthy. Try some of our UK video slots and win some! Founded back in 2007, It’s fair to say Pragmatic Play have certainly stamped their footprint on the online casino industry, no different the dinosaurs and earth all those years ago! Pragmatic Play although founded in 2007, they are continuing their remarkable rise to the top of online gaming as they maintain their production of high-quality games that are continued to be adored by avid slots players. Responsible for games like Triple Tigers, Vegas Nights and Diamond Strike. Pragmatic Play have adopted their own style of themed for games that can be seen throughout their repertoire, they tend to produce casino games with a dated style of theme with a modernised gameplay approach. And players just can’t get enough of it, it’s also worth mentioning that Pragmatic Play are very flexible when it comes to bonus features, they tend to have a fantastic variety in their games. Here on Wizard, you can find more games by Pragmatic Play. 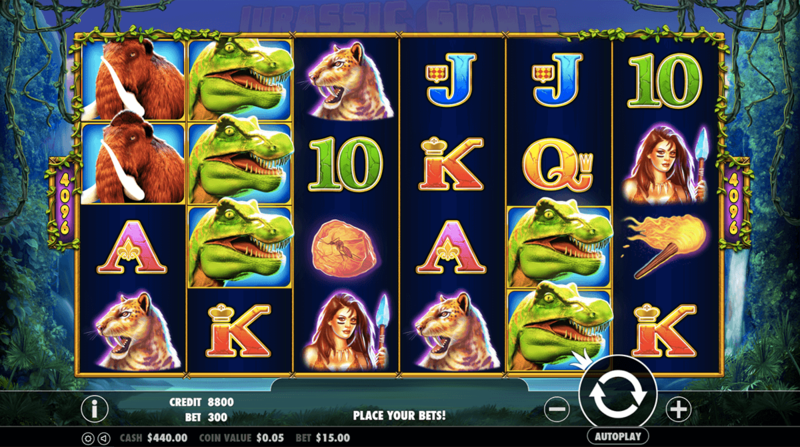 Jurassic Giants is a video slot with a larger 6 reels size, with a free-form paylines format. Due to their being no traditional paylines, the alternative way that you’ll play this game is all ways to win set-up, making it much simpler for players to locate any symbols that are matching on the reels. So, you can ease your mind of the worry of remembering which symbols land on certain reels as they just need to be found in columns adjacent to one another. If you thought the game couldn’t get any better, Jurassic Giants has two ways of gameplay, meaning that you have a doubled probability of winning than usual. Players who are placing lower stakes can begin their Jurassic slots adventure with a minimum stake of 0.50 while all you high rollers out there can enjoy the first stake as a maximum bet of 250.00. Experience the best video slots to play today. 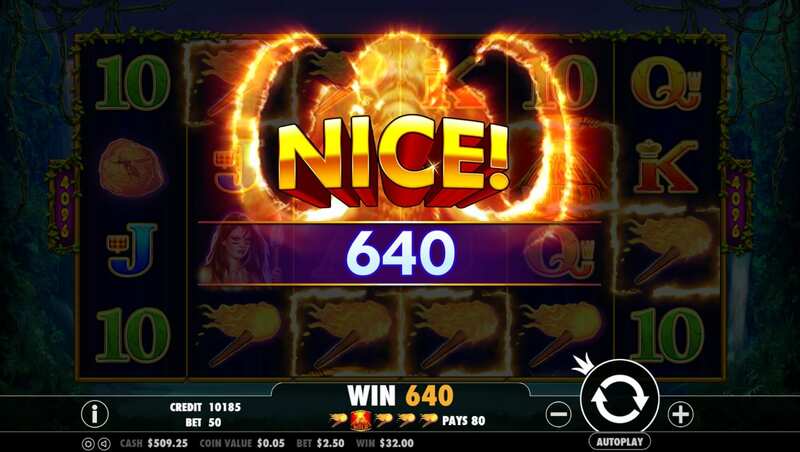 Wild Symbols: The Wild symbols are such an Important part of a slot game and that is no different in this instance, look out for the volcano symbol! Scatter Symbols: Scatters are the only symbols that the Wilds can’t replace, they will appear stacked in multiples on one tile. You need to land 10 to activate free spins. These can be landed in big batches in one go, the more you land the more free spins you’ll earn.